← College Hill Neighborhood Assn Meets Monday, Aug. 25, 7 p.m.
An example of the new style of streetlight is located at Walker Avenue and Fulton Street. 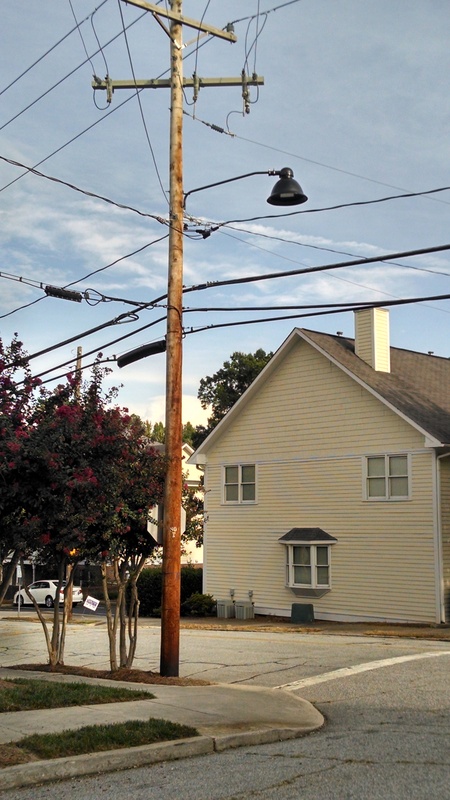 The city has offered College Hill a new style of streetlight for installation where additional lighting is needed. The new light, seen at left, is designed in a historic style. 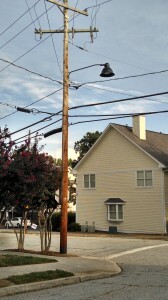 It’s mounted on utility poles, bypassing the expense and act of God required to get new historic-style lampposts. They use LED lights. If you look up at it from close range, you can see a square LED panel where a lightbulb would be. One of these lights has been installed for us to look at, at the corner of Walker and Fulton. The neighborhood association will consider this Monday evening. A number of locations in the neighborhood have been designated for additional lighting to eliminate dark spots. This type of light could go in those places. These also could potentially replace the conventional streetlights mounted on utility poles on Edgar Street. If you have an opportunity to go over and give it a look, let us know what you think by sending an email to this address. Thanks. If this is something people are OK with, it could speed things up on getting some dark areas of the neighborhood fixed up with better lighting. Updates: Responses to our request for comments. “The more I look at the quality of light this new style emits, the more I like it. The light is more focused towards the ground and does not spill into residential windows like the conventional overhead street lights tend to do. The light is soft and has a daylight feel to it. “I am unimpressed. It’s inoffensive, but certainly no substitute for the nice historic lamp-posts we currently have. About the best I can say is that if we need to throw some extra light somewhere that already has a utility pole, cheaply and quickly, this is probably the best way to go. This entry was posted in Fulton Street, Public Safety, Walker Avenue. Bookmark the permalink.